Over the past year we have heard a great deal about collective anger. During the run-up to the midterm elections, the news media provided daily reports on the anger of the American electorate, and it would appear that many took their anger to the polls. However, amidst all the expressions of anger, political and otherwise, words of gratitude have been in short supply. Now that the season of thanksgiving is upon us, where shall we find those words? The world’s great spiritual traditions abound in expressions of gratitude, and if you are affiliated with one of those traditions, you may already have all the words you need. If you are not, however, or if you would like to refresh your sense of gratitude, you may wish to explore three practices from the Zen and Vipassana traditions. Proceeding through the various parts of our bodies, as a doctor might, we acknowledge the normal functioning of our lungs, stomach, liver, and so on. We express our gratitude that each is serving us well. The purpose of this exercise is not to cheer ourselves up or convince ourselves that we feel something we don’t. Rather, it is to put us in touch with our latent capacity for gratitude, which may have yet to manifest in conscious feeling. In Vipassana meditation, such practices are known as bhavana, or mind/body cultivation, and they are an essential component of meditative discipline. May we live in mindfulness so as to be worthy to receive it. In Zen centers and monasteries around the world, these lines and others like them are chanted or recited in unison before each of the daily meals. For secular Westerners, group recitation may be impractical, but anyone can silently recite the Five Contemplations before tucking into a meal, whether the food on the table be a red-lentil curry or turkey with all the trimmings. Practiced wholeheartedly, meal chants can change our relationship, gradually but radically, with the food we consume. Although this text is particularly apt for the Thanksgiving holiday, it really knows no season. It can be recited, singly or collectively, at any time or place, and its cumulative effect can be transformative. If this poem speaks to you, you might post it on your fridge. Or perhaps above your TV. *Jack Kornfield, The Wise Heart (Random House, 2008), 399-400. **Translated by Sam Hamill, Gratitude (Boa Editions, 1998). 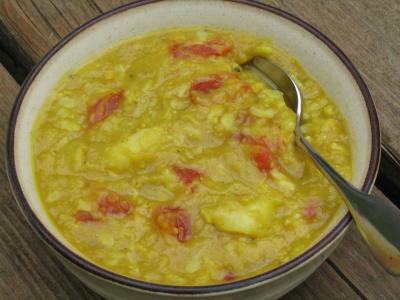 The dish pictured above is Curried Red Lentil and Barley Soup. The image is taken from the website The Joy of Mindful Cooking (http://mindfulcooking.org/) and is used with the kind permission of Eve Heidtmann.